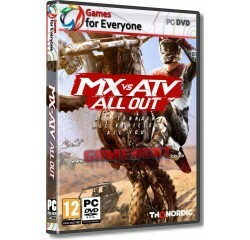 MX vs ATV All Out - R140,00 : Game Hunt, Where we lead, others follow. Choose between bikes, ATV's, UTV's, refine your rider style at your private compound and blast across massive open worlds to compete head to head in various game modes! The all new Freestyle mode allows you to win with style and crazy stunts! Or go All Out and show your riding skills in Multiplayer! Compete in various modes like Supercross, Nationals, Opencross, Waypoint, Tag and more. Master insane stunts and test your limits in freestyle mode. Turn your private compound into a show room for the all of your customized vehicles. Processor - Intel Quad Core i5 @ 2.5 GHz (or AMD equivalent)® or equivalent AMD® processor.